Convert MP4 video to WebM on Windows (10) with best video converting software for PC. MP4 (MPEG-4 Part 14) is one of the most widely used video formats, especially in portable devices. At present, it becomes one of the HD video formats for it is often used to package H.264 video and AAC audio. In a MP4 file, the media meta and data are individual and the organization of media date is very free. Also, it supports steaming media. WebM, developed by Google, is an open source and free video formats. It is a new media container format based on Matroska. Google combines its own-developed VP video codec technology combine with the open Ogg Vorbis audio to form a new media container format. It is considered as a pretty effective format used for HTML 5 videos on PC, notebook and mobiles. How to Convert MP4 to WebM on PC/Mac? Professional video converter that can help you convert MP4 video to WebM, AVI, WMV, MPEG, MOV, H.264/H.265, etc. HTML 5, the next generation language for website, offers a new video element and developers can directly embed video in website without any third party add-ons so that it becomes more and more popular for browsers on PC/Mac and phones. However, if you want to access HTML 5 video in browsers, you need to know which video format it supports. Although there is no specific answer, it is proved that MP4 and Web are supported through a lot of tests. Actually, you would like to directly use MP4 format for HTML 5 video because it is one of the most popular formats and supported by nearly all browsers. But, MP4 is the patented and non-free format and your MP4 HTML 5 videos are probably inaccessible if you don't have licenses from individual patent holders. 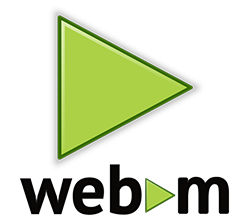 WebM is an open source and royalty-free video format, which is specially used for HTML 5 video. Because of its highly efficient bandwidth usage and small size, you can play WebM in browsers on PC/Mac or mobiles without very smoothly. The high-quality video it delivers can give you a great visual effect. At present, WebM has been supported by mainstream browsers, FireFox, Chrome and Opera. Also, YouTube is supporting WebM. In order to get access HTML 5 video in MP4 format on browsers Firefox, Chrome and Opera without any charges and licenses, the best solution is to transfer MP4 to WebM with a free MP4 to WebM converter – WinX Video Converter, which is a completely free video converter specially designed for fast and easily converting videos in popular formats, MP4 to WebM, MP4 to AVI, AVI to MOV etc, with high image quality. Preperation: Download WinX Free Video Converter and install it on PC. Step 1: Click "+ Video" to get your MP4 file added into converter. Step 2: After the file is added, an Output Profile dialog box pops up. Click "PC General Video" and find "WEBM Video (VP8)". Click OK. Step 3: Click Browse to set Destination Folder and hit "RUN" button to start conversion. 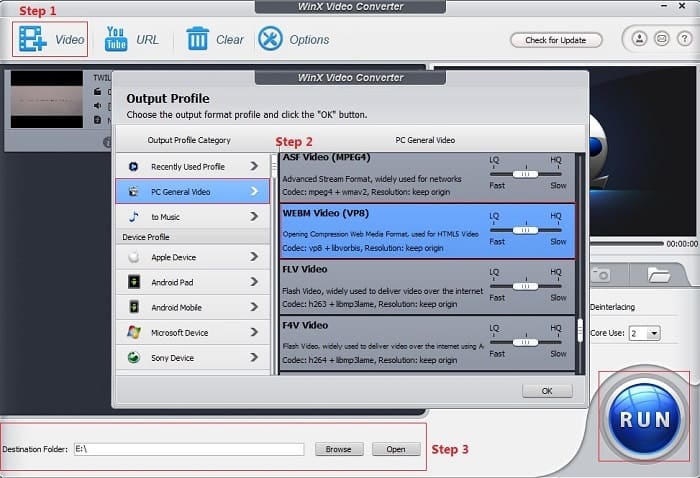 If you want convert HD videos, like MTS, MKV, AVCHD to MP4, WebM, for playback on PC/Mac or portable devices, iPhone, iPad, Samsung Galaxy S8/Note 8, HTC One, Sony PS4 etc, the advanced version of WinX Video Converter - WinX HD Video Converter Deluxe can give you a hand. All-in-one MP4 video converter to convert MP4 to WebM with high quality for sharing via YouTube, Skype and more. 1. Convert AVI, MP4, WebM, M2TS, MKV and more videots to NTSL/PAL DVD VOB for DVD burning. 2. Free Download any video in WebM/MP4/FLV/MP3 from YouTue, Vevo and 300 more sites safely. 3. "Yadif Double Frames" Deinterlacing Engine improves video effect if original video is interlaced. 4. Multi-core CPUs, QSV and CUDA/NVENC hardware accelerated video conversion speed. 5. WinX HD Video Converter Deluxe can auto fix incorrect data, like abnormal ratio, corrupted file. Purchase benefits: Lifetime full license and free upgrade. 30-day money back guarantee.